.we are delighted to have you visit Venison World. We are pleased to offer you an excellent selection of fresh, frozen exotic game meats as well as a popular line-up of premium ready-to-eat items. 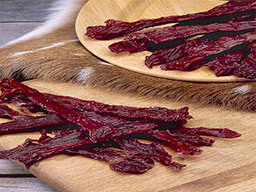 Choose from our original Axis deer cuts as well as from our new feature cuts of elk and buffalo (or bison). .whether a candlelit dinner for two, a cozy family dinner or an elegant buffet for friends or business associates. The deer hunters' favorite cut...The lean, tender cut may be grilled, broiled, pan-broiled, sautéed or fried. This versatile meat is packaged in one pound packages and may be used in a myriad of recipes for wonderful, center-of-the-plate dishes. This delightfully mild, lean and nutritious cut could easily become your favorite, as well. This tasty little snack sausage is cured, smoked and then dried. Made in the Texas Hill country tradition of the early German settlers, this spicy, lean sausage is perfect for any outing and is sure to please the sportsman on your gift list. Three rings for you to savor or share. We use lean, tender strips of venison leg or shoulder, spiced to perfection and slowly smoked over mesquite embers to create this delicious and yet so healthy snack. These tasty morsels are ready to slice and serve and are as at home in your backpack as they are at the football stadium or in your cozy kitchen nook. Conveniently packaged in 4 oz packages.